Everyone have their own way of making Sambhar, I grew up seeing my Grandma making the Authentic Kerala sambhar by roasting the grated coconut, coriander powder and certain other ingredients which is Known as Varutharacha Sambhar. I used to make Sambhar regularly my Grandma's way or the Authentic way till the time I was in Kerala and maybe no other way of making sambhar can beat that taste. 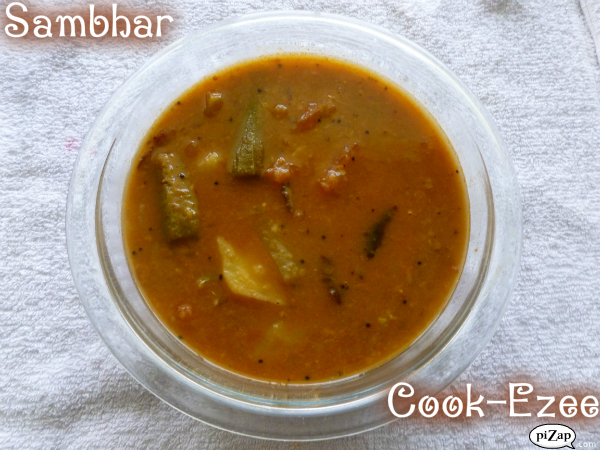 I started making sambhar without coconut after coming to US since coconut is not that readily available here as in Kerala and many time I ran out of it. I really started admiring the taste of this 'no coconut sambhar' from then and so do my sister to whom I passed on this recipe(not just my sis, my friends to whomever I shared this recipe and family loves it). I used the homemade Sambhar Masala powder made by my MIL, you can use store bought one's as well. 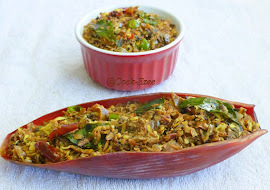 I am sure the easiness of making this and the great taste will surely make it a hit among your friend-family as well. So guys, here I'm sharing my way of making the all famous 'Sambhar' without coconut with all of you with the promise that I will surely share the recipe of authentic Kerala sambhar sometime soon. Enjoy!!!! In a pressure cooker wash and drain the Toor dal. Clean the vegetables from 2 to 7 and cut them lengthwise. Add them to the dal. Add 3 cups(add more/less) of water to the pressure cooker, add turmeric powder and salt. Pressure cook this for one-two whistles and switch off the flame. When pressure in the cooker settles or cool down, open it and add the drumstick, okra and Tomato. Squeeze well the soaked tamarind and add the tamarind water to the dal and veggies. Stir well with a ladle till bottom of the cooker to mix. 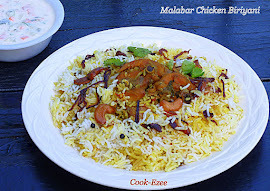 Heat up the flame and cook this on med flame for 10-15 mins or till drumstick is cooked. Add the chopped coriander leaves and few more curry leaves. Sambhar is ready to serve. Enjoy!!!! You can add the veggies of your choice or whatever you have in your kitchen. Veggies commonly used are Drumsticks/Muringakka, Okra/Lady's Finger/Vendakka, Brinjal/Vazhuthanangha, Beans, Carrots, Yam/Chena, Potatoes/UrulaKizhanghu, Yellow Pumpkin/Mathanga, Winter Melon/Kumbalangha, Plantain banana/Pachakkaaya. Sambhar masala is according to you taste, you can add/reduce the quantity according to the amount of veggies and dal used.